Master Recycler volunteer, Bonita Davis, shares tips to reduce and reuse during the holiday season. The holiday season is a time when we do more of everything, including celebrating and shopping. It can also be a time when a lot of waste is created in the process, but that doesn’t have to happen. This season, we can have some fun focusing on reducing and reusing to save money and go easy on the environment. Watch Bonita on KATU Afternoon Live, where she shares some of these tips with host Tra’Renee. Choose experiences rather than things because something out of the ordinary may be the perfect gift for someone on your list – and alternative gift ideas are often waste-free. Know what your family and friends like and want – and if someone has a gift registry for a special occasion, use it! Resourceful PDX partner, Chinook Book, offers coupons through the print edition or mobile app from local businesses and provides gift ideas and savings at your fingertips. In the long run, durable materials save us money and significantly reduce waste. Items such as plates, utensils, glasses and linens can be new, used, borrowed or rented. Holiday meals may include leftovers. Plan ahead to save containers, like yogurt tubs, or invite guests to bring their own containers to take home extra goodies. And don’t forget to use your reusable bags and travel mugs when you are taking advantage of holiday festivities and shopping excursions. 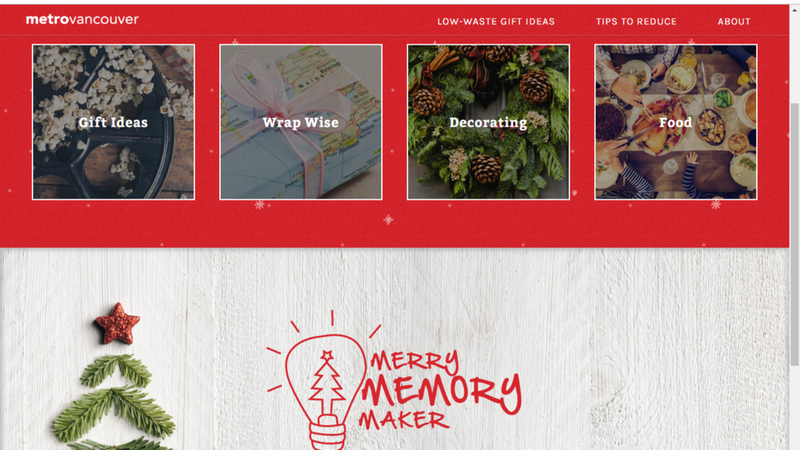 Creative reuse is the name of the game during the holidays. Reusing items and buying used materials can be fun and easy on our pocket. Make SCRAP PDX your first stop for cards, tags, bows, ribbon, gift bags and more. Collect old maps and the Sunday comics to use as gift wrap. Or use a bandanna or kitchen towel for a no-waste gift. Return, re-gift, or donate items you know you will not use. It is better to keep them in use with a new owner, rather than cluttering up your space with something you’ll never use. Many people need items during this time of year, so consider donating them instead. Everyone has at least one person on their list that’s nearly impossible to choose a gift for. Perhaps you have a teenager who wants everything, but likes nothing. Maybe a busy mom who is always trying to put a homemade meal on the table. Or an uncle who says he has everything he needs, but you want to give him something fun during the holidays. Fortunately, you can find a special something for everyone on your list and — bonus! — skip the retail lines to save your sanity, too. Wrap up cookie ingredients and include a coupon for a cookie-making playdate at your place. Make it extra special for a friend by taking care of cleanup, too. For adventure seekers, take a trip downtown together and brave the Portland underground tunnels tour. Portland offers many ways to make it yourself. Try a woodworking class at the ReBuilding Center, or make something special at one of the many do-it-yourself workshops around Portland. Who doesn’t love to learn something new? Portland offers nearly endless options for classes, tours, lectures, and much more. Is your uncle a cheese lover? Save him a seat in OMSI's Design Lab where he can learn to make his own cheese. Help those busy parents in the kitchen by giving them a cooking class. And for that impossible-to-please teen? Gift a video production class at Portland Community College.